One of South Africa’s key objectives behind the expansion of the soybean crushing plants was import substitution of soybean oil and oilcake. The country has made notable progress on both products as imports have been on a decline in the past few years due to an increase in domestic production. Most notably, between 2010 and 2017, South Africa’s soybean oilcake imports declined by 42 percent to 553 003 tonnes. Moreover, South Africa’s soybean oil imports declined by 30 percent between 2010 and 2017 to 191 255 tonnes. With all the aforementioned improvements, the sector hasn’t fully utilised its soybean crushing capacity (see featured image). 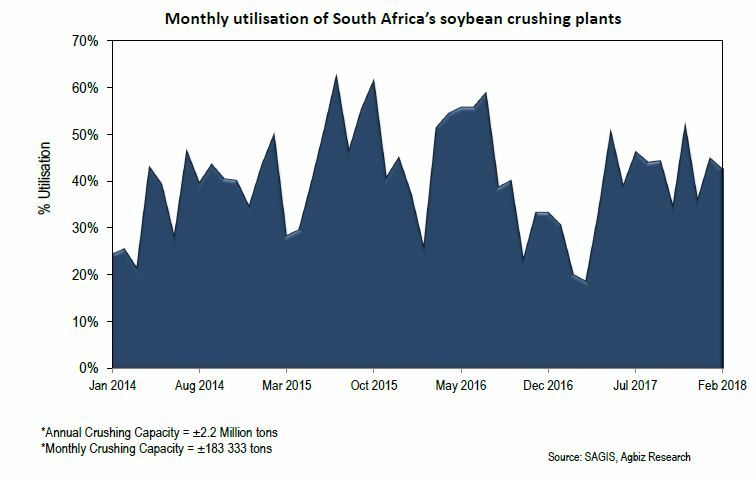 South Africa has an estimate of 2.2 million tonnes soybean crushing capacity, which equates to 183 333 tonnes per month. The country utilised 43 percent of its monthly soybean processing capacity in February 2018, which is double the capacity utilised in February 2017. Over the past two years, the sector has utilised, on average, about 40 percent of its monthly crushing capacity due to a combination of factors, which include relatively lower domestic soybean supplies, amongst others.